GAIETY TOYS – CASTLE ART PRODUCTS LTD.
Gaiety Toys was the trading name used on a relatively small range of toys produced by Castle Art Products Ltd., a die-casting company incorporated in March of 1946 with its trading address given as Prospect House, Tyseley Industrial Estate, Seeleys Road, Birmingham, England. 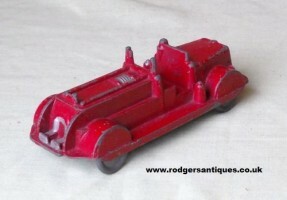 As far as I am aware the range of road vehicles simply consisted of three racing cars, a Morgan 3-wheel sports car and a fire engine although at the time of this post I have yet to come across the fire engine model. 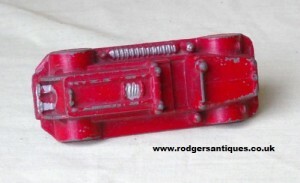 The racing car models were a well detailed, one piece casting, with holes drilled through the body to accept the metal axles onto which were fitted the all metal wheels. The racers had no baseplate and had ‘Gaiety Toy – Castle Art Products’ cast into the underside of the body along with a castle image. The Morgan sports car was produced at 4.75″/12cm in length, no driver within the model and it came in various colourway finishes, red, blue and green as well as an all chrome version. model 1 – Produced at 5″ / 12.7cm length, head and shoulders single driver cast in. model 2 – Produced at 4″ / 10 cm length, head and shoulders driver and co-driver cast in. model 3 – Produced at 3.25″ / 8.25cm length, head and shoulders single driver cast in. All racing car models came painted in various single colourway finishes, red, blue and green as well as all chrome finish. 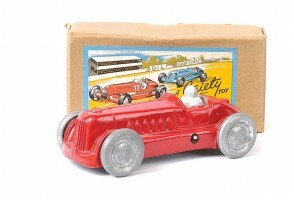 The racing cars, along with the Morgan 3 wheelers, were all produced in either free running or clockwork modes and came in a simple thick cardboard box with a single coloured line drawing lable. Also produced under the Gaiety banner by Castle Art Products was a range of electric ’OO’ gauge railway locomotive models which came in a plain card box with a simple printed black and white lable. Alternatively one could purchase the loco body shell only, either painted or unpainted, which could be fitted with your own chassis. These body shells had ‘British Railways’ cast into the side tanks and came in a plain, thick cardboard box. 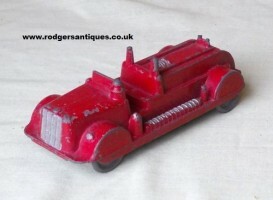 The following pictures of the Gaiety Toys fire engine were kindly sent in by Don Stephens – much appreciated Don ! Masudaya was formed in Tokyo in 1924 and is widely regarded as the oldest of Japan’s toy makers. 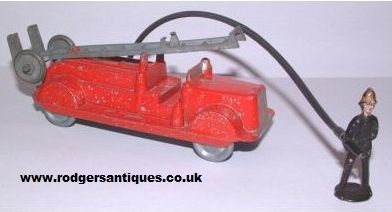 Masudaya was a leading manufacturer of tinplate toys, both mechanical and battery operated, in the post WWII era. Its logo incorporates the letters ‘M’ and ‘T’ within a diamond lozenge and is often referred to as ‘Modern Toys’. Masudaya produced a wide range of tin toys including aircraft, racing cars, military and civilian vehicles, motorcycles and the ever popular space toys which included the classic ‘Radicon Robot’ in 1957 which is regarded as the first remote controlled robot. Masudaya as a company survives to this day. 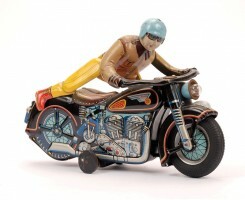 Large tinplate motorcycle toy dating to c1962. 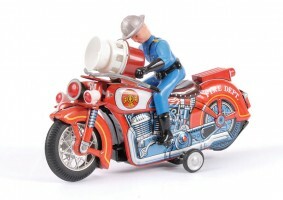 Battery operated model, tinprinted in ‘Fire Department’ livery, red colourway finish with blue uniformed plastic rider. Fitted with siren to front and stabalising wheels, 30cm. 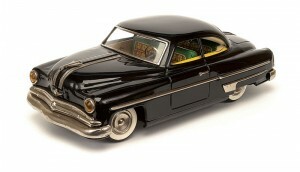 Tinplate 2-door Pontiac Sedan friction drive model in black colourway finish with green/yellow detailed tinprinted interior. Plated parts including hub caps, model has steerable front wheels with white wall tyres, 36cm. 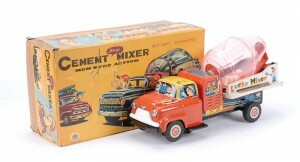 GMC tinplate cement mixer dating c1950, battery operated truck with ‘mystery action’ to underside. Marked ‘Lucky Mixer’, model has detailed tin-printing to cab and generator, predominantly orange colourway finish with see-through plastic drum, 30cm. 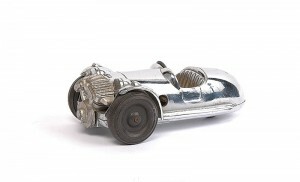 Large scale tinplate racing car, battery operated with ‘mystery action’ to underside. Detailed tinprinted exterior in blue, white and red colourway, racing number ’38′ fitted with tinplate driver. See-through engine compartment, side exhaust, rubber tyres with detailed hubs, 43cm. Large scale tinplate battery operated ‘Atom’ motorcycle, model in black colourway finish with detailed tinprinted engine compartment in predominantly silver finish. Tin rider in yellow and brown with blue helmet has demountable action, Reg.No 65301. Motorised action with engine noise and working head light, 30cm.